The weather might not have felt much like Summer, but Lyle and I had a great day out at the Shrewsbury Food Festival last weekend. For the third consecutive year, more than 20,000 visitors piled into the Quarry Park in Shrewsbury over the two days of the festival. And what a festival it was! I was very kindly given a free ticket to the event, and so Lyle and I paid the show a visit on the Sunday. The weather was definitely on the cool side for June, and there was some rain thrown in for good measure, but that didn’t seem to be stopping anyone from having a great time. The Quarry was filled with music, entertainment and 200 fantastic stalls selling all kind of food and drink. Exhibitors came both from Shropshire and from further afield, and there was masses to eat, drink, see and do. A lot of my local favourites were there again this year, including Coopers’ Sausage Rolls, Parkhill Farm and Toot Sweets Chocolates. It’s so difficult choosing what to try first, and there is something to suit all tastes. The Thai Street Food stall always seemed to have a huge queue of hungry festival-goers waiting to sample their food. And I was pleased to see that Old Granary Pierogi were at the show again – they were one of my favourite finds of last summer. 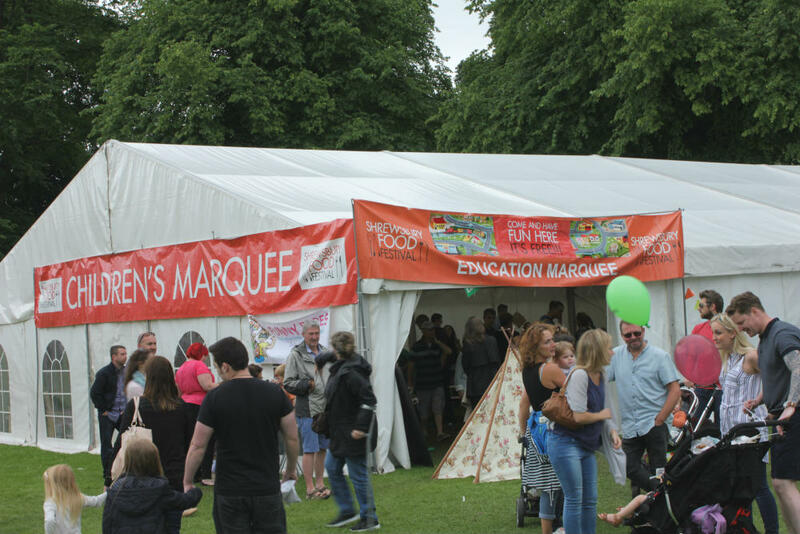 Shrewsbury Food Festival is a great day out for the whole family, and the Children’s Marquee was looking very busy as we went past. And even the family dog is welcome at this festival – we saw plenty of pooches walking around with their families. Dogs’ Trust Roden also provided a Dogs’ Creche for those who needed a bit of time out from the hustle and bustle of the busy festival site. The sun might not have been shining, but it was still perfect weather for an ice-cream. Polly’s Vintage Ice-Cream Parlour was another repeat visitor from last year, but this time Lyle and I decided to treat ourselves at the Shropshire Ice Cream Company van. 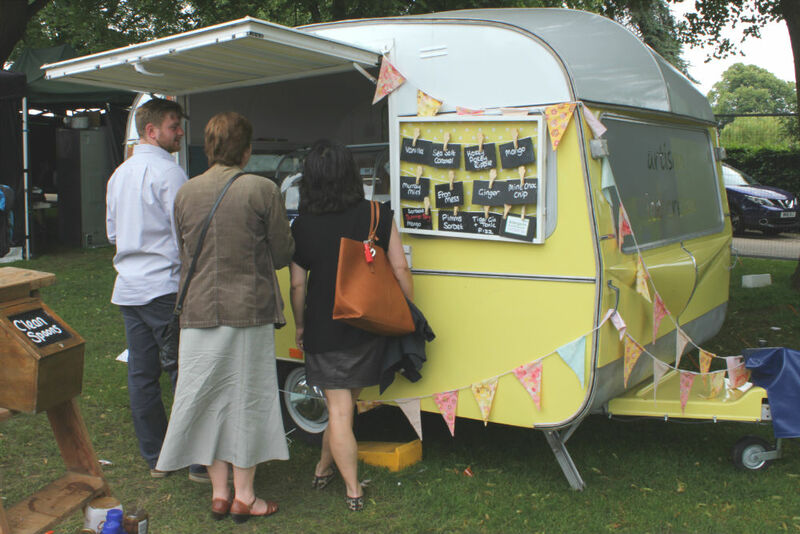 It’s such a cute little van, and they use local fruit, eggs, milk and cream in their delicious ice-cream. Lyle always goes for his favourite flavour – Mint Choc Chip – and I have to say that this was a particularly good choice. Very creamy, with a delicious minty flavour, I almost wished that I’d had the same! But instead I opted for one of the show specials – a very grown up Tiger Gin and Tonic Fizz. I was given a cup with a scoop of sorbet made with locally-made Tiger Gin, two tiny lemon slices and a little tot of tonic water to pour over it. It was absolutely delicious, very sharp and refreshing. 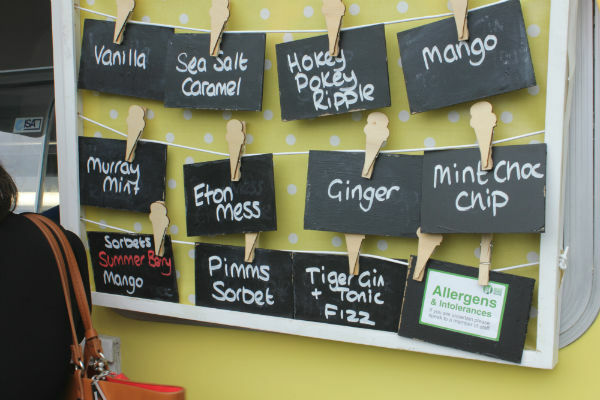 The Shropshire Ice Cream Company are regularly at local events and festivals. Or if you are ever in the area, the Greenfields farm shop in Telford also carries a small range of their produce. The festival takes place throughout Shrewsbury town centre, and there was a great atmosphere in the whole town, but it was particularly buzzing in the Quarry Park. Live music on the Bandstand and the Buttermarket Unsigned Music Stage really added to the atmosphere. Of course, Lyle and I did a bit of shopping while we were at the festival. We tend to walk around a festival tasting anything that grabs our attention and then go back later to pick up the things we’ve really loved. 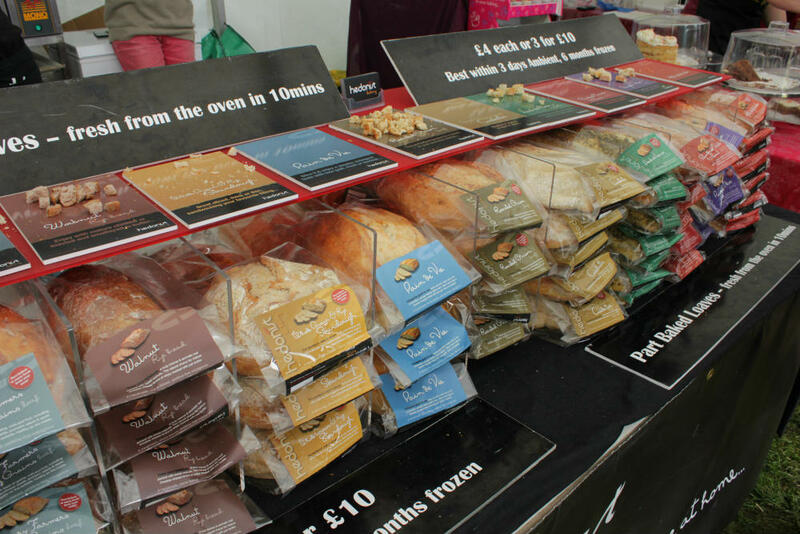 Our first port of call this year was the Hedonist Bakery stall for some of their fab part-baked loaves. They are really delicious, and will sit very happily in your freezer for up to 6 months until you are ready to bake them. And they are also available online from their website, it’s definitely worth checking out! Of course, bread and cheese are a natural pairing. And Lyle is such a cheese fan that we always end up picking some up when we go to festivals together. This time we picked up some from the Bexton Cheese stall – unfortunately it looks like they don’t have a website. They are frequently seen at food festivals and shows so keep your eyes open for their individual farmhouse cheeses. I also picked up a set of 4 delicious salad dressings from A Little Bit. The dressings are made with fresh herbs so they taste really zingy, my favourite is the Red Onion and Parsley. Mark and I are eating a lot of salads right now, so these will definitely come in handy! And my final purchase from this year’s Shrewsbury Food Festival was a pot of scrumptious Strawberry and Pimms jam, from Miranda’s Preserves. The jams, marmalades and chutneys are all hand-stirred at Ivy Cottage in the Brecon Beacons. I think this one will be perfect on a scone with some clotted cream while I watch the tennis. We had a fabulous day at the Shrewsbury Food Festival, and I can’t wait to see what the organisers have in store for 2017! Oh it looks fab! I live in a small town that does a food festival too! It’s so nice to see! What a nice day out! Trying out the new dressings will be fun. That jam sounds good too. If there’s one near you, you really should pop along – they’re great fun! This looks like a brilliant festival. My in laws are from this area so will let them know about it for next year. Do tell them – the festival is getting bigger and better every year! I’ve always wanted to go to a food festival and this one looks so fun! I am glad you enjoyed yourself!